Estate of the artist; purchased May 1982 through (Marlborough Gallery, Inc., New York) by Robert and Jane Meyerhoff, Phoenix, Maryland; gift 1992 to NGA. Provenance from The Robert and Jane Meyerhoff Collection 1945 to 1995, Exh. cat., National Gallery of Art, Washington, D.C., 1996: 256. [group show], Marlborough Gallery, New York, 1982. Ad Reinhardt, Museum of Modern Art, New York; Museum of Contemporary Art, Los Angeles, 1991-1992, 21, 26, 52, color repro. The Robert and Jane Meyerhoff Collection: 1945 to 1995, National Gallery of Art, Washington, D.C., 1996, no. 150, color repro. 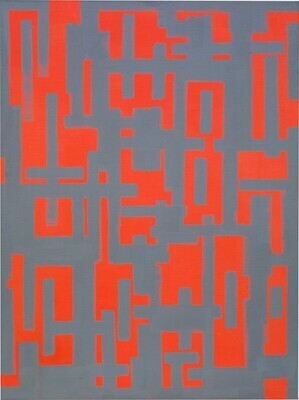 The Robert and Jane Meyerhoff Collection: Selected Works, National Gallery of Art, Washington, D.C., 2009-2010, pl. 100. The Robert and Jane Meyerhoff Collection: 1945 to 1995. Exh. cat. National Gallery of Art, Washington, 1996: no. 150.